It's that time of year when we celebrate the father's in our lives, whether it's your biological father, your step father, someone who's been a father figure to you and even the grandfathers. Like mums, dads should be appreciated all year round, however, I appreciate that parents get their own day each year, its a day where we get to show off our love that little bit more. 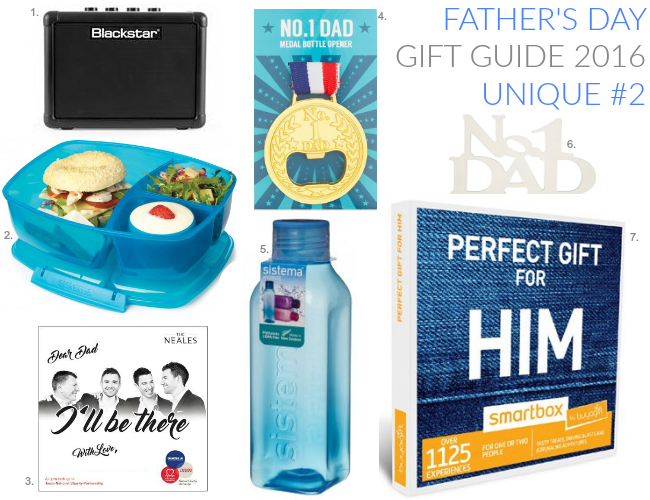 It's become quite the norm now on Unique Young Mum to have a Father's Day feature, so without further ado, welcome to Unique Young Mum's 2016 Father's Day Gift Guide, showing off cards, personalised gifts, food, drink, fashion and much more! No matter your budget, I'm sure there's something here for everyone! 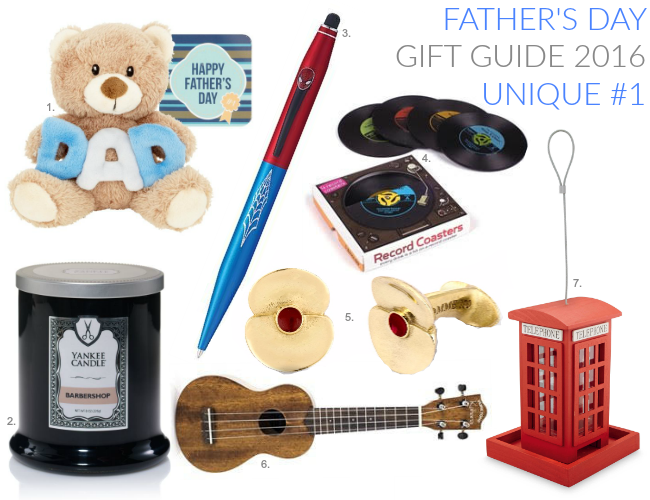 Remember though, gifts are just as thoughtful as cards, and if money isn't something you have right now, I'm sure your dad will appreciate a lovely greeting all the same! Postsnap is a free to download iOS app which lets you create personalised photo greeting cards, announcement cards, postcards and even invitations using your own photos. The products can be easily personalised with messages thanks to a range of fonts and colours. Don't buy cards from the shop this year, go that extra mile and give our dad a high-quality printed card that can be made quickly and easy by you, but means a lot to him! This beautiful walnut wood keyring is engraved with the quote 'Home Is Where Dad Is' on the front, but thanks to the Create Gift Love's unique shopping experience, you can not only personalise the front of the keyring, but you can personalise the back too! This enables you to make a personal and thoughtful gift for your father, with words from your heart. Launched only last month in May, Now Frame It aims to take the hassle out of choosing, buying and framing the photos stored on your phone, tablet or PC. In just five simple steps your family photos can be uploaded, stylishly framed from a selection of different style and sized frames, and delivered. So why not treat your dad to a picture of the grandkids? Or maybe a picture of him and you when you was both younger!? For the dad that likes to carry cash, this personalised money clip from Prezzybox will be the ideal gift! The tight black leather money clip means dad's money will definitely not be going anywhere, it's made from black PU leather with a cream lining and a cream stitched outline, that works fantastic together for that overall good quality feel and look pleasing even the fashion mad dads! Personalise the clip with up to three initials - perfect to spell out 'dad', or just use his initials! Even if they don't admit it in fear of upsetting someone else's feelings, dads do have a favourite chair! They may not get to sit there as much as they'd like, but why not let dad know you know its his chair with this 18'' square cushion? 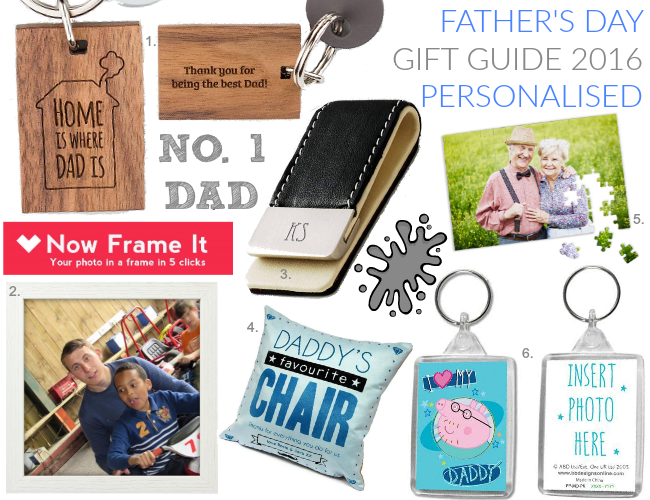 Personalise with a meaningful message, a love you and your name and light up dad's face, and chair this Father's Day. If your dad is a jigsaw fan then why not treat him to the best jigsaw of his life? If I was buying this for my dad, I'd get one of his six children, or six grandchildren! Available in three different sizes, even the beginners to jigsaws can get involved! The 5x7 jigsaw contains 40 pieces, perfect for those who're new to the jigsaw scene, the 10x8 contains 120 pieces, and the 16x12 contains 204 pieces. If you've got a little Peppa Pig fan in the household who's looking to treat their daddy on Father's Day, then this keyring is the perfect bargain buy for them! The front features Peppa's daddy - Daddy Pig, with 'I love my daddy', whilst the back enables you to add a personal photo making it the perfect buy for younger children's dads! This furry friend will make Father’s Day un-bear-ably good. It's perfect for dads who like a cuddle, and who doesn't like to be reminded that their a dad when the kids are in bed? If your dad is a superhero fan then this gift is the perfect present for him! The Cross Marvel Collection doesn't feature just one superhero pen from the Marvel Universe, they feature three! Choose from Spider-Man, Captain America or Iron Man! The pen's are from the brand's Tech2 style, which see's the pens transform from a ballpoint pen to a stylus in a super hero flash! Finished in a metallic lacquer and displayed in a Marvel themed box, what are you waiting for!? Who doesn't love music? If your dad's from the old skool era where music was played via records, then why not treat him to this pack of four Record Coasters? Packaged in a box featuring a quirky record player design, these ultra retro-chic record coasters are durable and brightly coloured, perfect to place drinks on, or for dad to show off to friends at his unique gift! These limited edition golden Poppy cufflinks tell the story of the sacrifice made at the Somme. The Royal British Legion are hoping people will don a poppy of a different kind, and all year long! July 1st marks 100 years since the start of the Battle of the Somme, which claimed the lives or injures more than a million men. Gift dad this Father's Day and help support The Royal British Legion at the same time! It's a win win for all! If your dad's into musical instruments, more so the ukulele, then this Pure Tone Kahana Soprano Ukulele is the perfect for the dad in your life! It's the perfect ukulele for travel, and will be sure to delight with it's sweet and funky ukulele sound! Made using high quality African Mahogany and finished with a natural matt look, it looks rather dapper too! There's something about the old fashioned phone boxes that I just love, so of course I had to include this Phone Box Bird Feeder! Available in red and blue with a hanging wire at the ready, and costing less than a fiver, I think this will go down a treat with the old fashioned dad's who love the garden wildlife! The Fly 3 amp from renowned Amplifier kings Blakstar is the newest mini guitar amp on the scene! With its three watts, two channels and tape delay effect, it makes it one of the best sounding and coolest looking little amps around! Small doesn't mean small quantity and this amp proves just that! The battery powered speaker has a classic design and will be perfect for playing dad's favourite songs in the garden as it can be connected to a mobile, laptop and tablet! If your dad makes (or even has his lunch made for him!) and takes work to lunch with him, and you're struggling to buy him a gift this year because he already has everything then why not treat him to a new lunch box? Sistema have a great range of lunch boxes available, in a variety of colours including clear! This box pictures is a 2L triple split lunch box with a yoghurt pot, making it the perfect size for a grown mans lunch! What's more, the box is stackable, freezable, microwave and dishwasher safe! This Father’s Day, Tesco wants to help families show dads just how much they’re loved, so they've teamed up with The Neales to launch a touching charity single that does just that. ‘I’ll be there’ is a brand new song by the father and sons group, available in a specially designed sleeve, so people can show their dad the love and appreciation he deserves and support a great cause too. The cover can even be personalised with a name or message to make the gift extra special. All proceeds will go to The British Heart Foundation and Diabetes UK, charities that are focused on diseases that affect many dads across Britain, so every purchase of the single helps ensure dads can enjoy Father’s Day for years to come. The single is available to buy at the checkout in most Tesco stores or to download from iTunes. Gift dad or grandad the medal that says it all this Father's Day! Show them just how much they mean with a medal they can wear around their necks, but a medal that also doubles up as a bottle opener, making it the ideal gift for the dad or grandad who likes a drink or two! If your dad likes his walks, or takes lunch to work with him, then this 750ml water bottle from Sistema is a great gift! With a retro design influence featuring in all areas, Sistema have decided to introduce these retro inspired square bottles, featuring easy grip concave sides and seal-tight screw top lids! The bottle comes in a range of colours, is freezer, microwave and dishwasher safe. If dad's desk, shelf or shed is looking a little bare, then why not buy him this affordable No.1 Dad sign to show him just how special he is to you? This is just one of many affordable, yet stylish products available to buy from Morrisons online and instore. TIs the dad in your life notoriously hard to buy for? Fear not, Buyagift have it covered with this gift just for him! From a selection of over 1000 Driving Blast, Tasty Treat and Adrenaline Adventure experiences days, to gourmet cuisines at top restaurants, grooming treatments, bungee jumping and much more, let your dad pick an experience he'll love using this voucher! 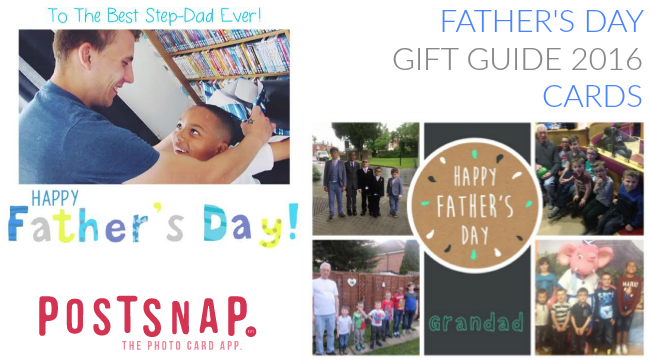 You're sure to find a gift on Buyagift for the dad that has everything, or the hard to buy for dads, and this voucher is just one of many suitable for Father's Day! For the dad's who love to keep fit and healthy, then the new Fitbit Blaze Gunmetal is the perfect gift for him! It's a smart fitness watch designed to help maximize every workout, every day with revolutionary features like PurePulse heart rate, Connected GPS, on-screen workouts, smartphone notifications, sleep tracking and more! The new light switch timer is the first timer which simply fits over any standard light switch on the wall and requires no wiring to install. Allowing dad to program his main home lights to come on and go off when he's not at home - perfect if your dad works late or away from home. The product has been accredited by the Police and recently won Insight DIYs Gold award for best new security product 2015! So why not help your dad improve his home security this Father's Day? The Roku Streaming Stick transforms any flat screen TV into a Smart TV, giving dads access to the UK's most comprehensive range of streaming channels. Whether dad wants to catch-up on TV programmes from BBC Sport or iPlayer, All 4, ITV Hub, Demand 5 or stream movies and TV shows on demand from Amazon Video, Netflix, Google Play, Sky Store or NOW TV. With a Roku Streaming Stick, it's all available on the main TV screen! With more than 1,700 channels available, there is so much content packed into this tiny stick that busy dads will really appreciate! Let your dad shake off the sensible and experience the freedom of filming whatever he wants, wherever he wants. Whether he's about to pull off a daring stunt or looking to capture the chaos amongst friends on a Friday night, the Kitvision Escape's 720p HD video and built-in display means dad can line up the perfect shot at a moment's notice. Waterproof up to 30 metres, the Kitvision Escape lifts the limitations when it comes to recording memories across both land and sea, while switching to photo mode allows dad to snap images of 1.3 megapixels. Let dad escape the norm, break the mould and let the good times roll! With colossal sound and five hours playtime, the dual active and dual passive drivers on this portable speaker provides crystal clear three-dimensional sound, perfect for all dad's who love their music! Give dad the stereo experience without the stereo size! The JAM Alloy will let dad sync up any Bluetooth device in a 30-foot range, as well as a battery that lasts for up to five hours, giving dad plenty of playback time! 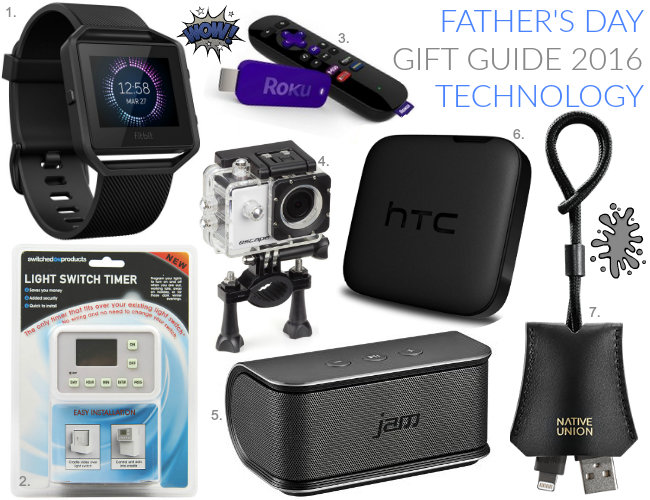 Reward dad this Father’s Day with the HTC Fetch. This clever gadget ensures forgetful dads will never lose their keys, phone or wallet again. Just press the button and the sleek, compact keychain device – which can be linked up to any smartphone via Bluetooth – activates the phone’s ringtone within 15 meters. When he pairs it with his phone he’ll get a warning beep if he misplaces it. If he happens to lose both, a convenient map location feature will notify him where the HTC Fetch and phone were last together, meaning he’ll never lose them again. The only thing this can’t guarantee is that he’ll remember your birthday! If your dad is always running out of battery on his phone, then Native Union's luxury tech collection can help you out with buying your dad the perfect gift! The TAG Cable is a stylish, genuine leather charge and sync cable that's been designed to elegantly loop around any bag or key holder, making dad's no battery excuses impossible! Available in black or tan, there's a style to suit all dads. If your dad likes his gardening tools, then this petrol hedge trimmer will be perfect as a new or upgraded gift! It trims and shape hedges quickly and easily with a double-sided blade and a 2-stroke engine. Accessories includes a Spark Plug Key, Screwdriver, Spanner and Hex Keys. Features 25cc 900W output power, double-sided blade, recoil start system and a two stroke engine. Sugru feels like play-dough, and it's that easy to use too. It bonds to almost any other material and cures just by exposing it to air. Its durable cured properties mean it'll stay strong and securely bonded anywhere from the freezer to a steamy hot shower, from the home to the great outdoors, so treat dad to a Sugru starter set and introduce him to the amazing world of Sugru! The Hedgehog® EasyAirWedge™ is a handy new tool-box essential, perfect for any dad who has struggled to lift heavy items in the kitchen or around the house! If dad needs to fix, clean behind or simply retrieve something that's rolled underneath a heavy item, then this product provides a simple solution! It's a inflatable bag manufactured from heavy duty material which simply slides into awkward or narrow gaps, it's then inflates/deflates with a few quick pumps, to lift or lower objects without dad hurting his back! With an array of features including saw blades, a sanding plate and a scraper, this cordless tool will help your dad take care of loads of DIY tasks! From scraping and cutting to sanding, dad can get lots done with this handy tool! Accessories include a plunge saw blade, scraper, sanding plate, diamond saw blade, HSS segment saw blade, 20x sanding paper and a dust extraction adaptor. Features include a precision oscillation function, 5000-19,000rpm no load speed, 3° oscillation angle, 3-5 hours’ charging time, LED work light and electronic speed control making it the perfect multifunction tool! The Leatherman Freestyle is the world's first true pocket knife/tool hybrid. Compact, tough and ready for anything, it'll be the perfect lightweight multi tool for dad to carry around with him whilst doing DIY task at home or work! Tools included are a 420HC Knife Blade - part serrated, Hard-Wire Cutters, Needlenose Pliers, Regular Pliers and Wire Cutters whilst featuring 100% Stainless steel body, 25 Year Warranty, Removable Pocket Clip and a Zytel Handle Insert! Made from high-quality chrome vanadium steel, this wrench is robust and hard wearing, it's ideal for a range of maintenance and DIY tasks that dad's yet to carry out! A bargain steal at just £3.99, it's just one of many DIY tools that Aldi have to spoil your dad with this year. 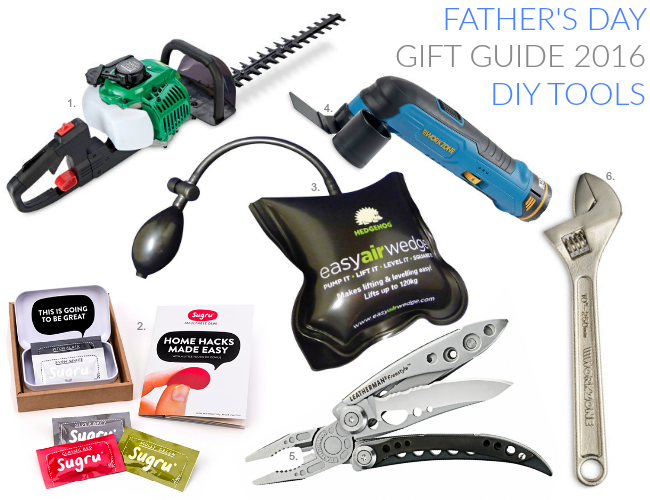 Gift him and stop the excuses at the same time, after all, dad's our great for fixing things! Got a dad who loves to clean his trainers and sports shoes excessively? Then this soft bristle shoe brush will be the perfect gift for him! It doesn't hook onto material, used ideal for delicate materials leather, suede or cotton mesh, so suitable for most of dad's shoes! This year, why not give Dad the gift that keeps on giving with a pair of anti-smell socks!? These socks takes fresh feet to a whole new level, using copper ions to create a life-long anti-microbial net around the foot! It doesn't stop there though, other features of Bridgedale’s WoolFusion® Trekker with CuPED™ Technology include: extra cushioning in the Achille, thick over foot padding with Flex Zone for improved fit and comfort, additional Lycra in the arch and ankle for enhanced support and stability making them the perfect socks for dads who like walking, trekking or who simply have sweaty smelly feet! The Made in Britain collection from Chatham are the perfect shoes to gift to any fashion conscious dad this Father's Day. The collection offers the first boating shoes to be made in Great Britain, featuring four styles, each in a choice of colour ways. Choose from Pitt (featured), Balfour, Peel or Churchill. If your dad is a proud leather owner then this leather cleaner from Mr Black will be a great small but favourited gift! If your dad hasn't got any leather, then check out Mr Black's other range of products, including shoe cleaner, wool and cashmere wash, dark white, white wash and many more! Global outdoor brand Helly Hansen is spoiling us for choice this Father's Day, from shirts, polo tops, t-shirts, jackets and hoodies, there's bound to be something for any type of dad! Treat your dad to the higher end brand and watch as his love for Helly Hansen grows - just like it has here in the Unique Young Mum household! Windrush includes three extra sets of high definition, lightweight and shatter-proof polycarbonate lenses, to ensure the very best visibility whatever the light conditions. Wider lens coverage provides further protection to your eyes from sunlight, wind, sand and flying objects. With plenty of features why not upgrade your dad's sunglasses for his Father's Day gift? 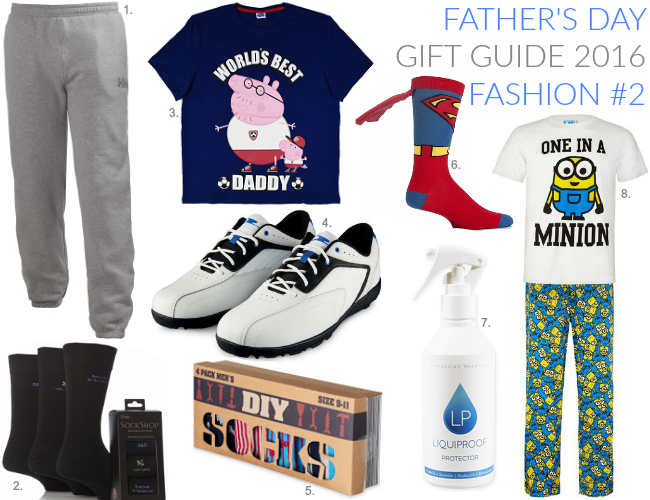 These pyjamas have got to be the best Father's Day pyjamas around! Not only are they Star Wars pyjamas but they also say 'I Am Your Father' - is that not the coolest!? Well I think they're! Available in sizes small to XXL, so all Star Wars mad dads don't have to miss out! They're available to buy online and in selected stores. British heritage brand Pantherella provides bespoke luxury socks monogramming service on a range of yarns and colours. These unique socks would make the perfect gift for a special occasion such as Father’s Day. Available in UK men’s sizes 6 to 15, the monogramming service is available from £20.00 online. Help your dad stay warm and comfortable in these Helly Hansen sweat pants, he can lounge around the house in them or even wear them to the pub for a casual drink or two! Available in grey or navy, in sizes small to 2XL. If sweat pants aren't your dad's style, then check out the Helly Hansen website for lots more styles and fashions! For Father’s Day, give Dad some fresh socks for his drawer specially made for him! Each pair of soft classic cotton rich socks in this triple pack has a fun embroidered slogan, but are tasteful enough for him to wear to work if he wants! SockShop Best Dad In The World socks are all half calf length, have comfort cuff and handlinked toes for smooth seams, important when you’re wearing them in fitted business shoes, because they don’t rub like normal seams do! This year Father's Day ties in with the EURO football that most men will be watching, so why not treat the dad in your or your children's life to this Peppa Pig Daddy Pig T-shirt from Asda? The slogan says 'World's Best Daddy' with a football printed either side! Available in sizes small to XXXXL. Available online and in selected stores. If your dad's into golf and in need of new golf shoes, then why not head down to Aldi who have golf shoes for less than £20!? These high-quality golf shoes are made with real leather (combination leather) with a sturdy rubber outer sole. They feature a removable insock and are water resistant ensuring dad's feet will stay dry! Available in sizes 8-11 in store and online! If your dad's a DIY enthusiast he'll love these socks, with designs featuring tools and striped patterns! Whilst two pairs are striped, the other two pairs are striped but features tools such as hammers, screws and paintbrushes. Available in sizes 6.5-8 or 9-11, in store and online! Is your dad your super hero? If so, show him that he’s your own Superman with these inventive SockShop Superman Cape Socks! The socks feature superman’s instantly recognisable outfit – including his red cape at the calf. These calf capes will flutter along with him, especially if he wears shorts (which is better than wearing his pants on the outside of his trousers)! They're comfortably cotton rich and also come in a Batman design, should you want a superhero team-up! Liquiproof is an award winning, life saving product with a million uses! It allows fabric surfaces to become liquid repellent! By protecting his apparel and furnishings with Liquiproof, your dad can enjoy the carefree lifestyle of knowing that his belongings will be shielded from damage, stay cleaner and look smarter for longer. As seen on Dragon's Den, Liquiproof can be used on jackets, coats, all kinds of footwear, rugs, carpets, curtains, suits, ties, hiking/camping gear and much more! Want to tell your dad how much he means to you? Then why not gift him a pair of these super cool Minion pyjamas from the Nutmeg range at Morrisons? Available online and in selected stores, in sizes small to XXL, they're just one of a few pyjamas you can gift to your dad from Morrisons this year! Power Health's beard oil is not only super luscious for chin locks/stubble, but it's also great for the skin and it smells amazing! Available in two blends, The Citrus Blend and The Warming Blend, they're made with olive oil, Jojoba and Vitamin E as the base ingredients! The new Gillette Fusion ProShield has lubrication before and after the blade shielding the skin from irritation. With Gillette’s thinnest, finest blade edges for less tug and pull, the FlexBall technology allows the razor to pivot and respond to facial contours for maximum contact, giving your dad a perfect shaze for any Father's Day meals or events you have planned! The Pour L'homme range (bath and hair gel, luxurious shaving cream and Galet Marbled Soap), is available in a Garrigue fragrance which consists of citrus cologne with notes of bergamot around an aromatic lavender and thyme on a woody sandalwood base. The products are perfect to help de-stress, rejuvenate the skin and promote general wellbeing, so why not treat your dad to some personal luxury this year? Made in Italy, Marvis is the classic, original Italian toothpaste in gorgeous nostalgic packaging. Who knew toothpaste could be so desirable? The toothpaste freshens breath, and helps protects teeth from tartar, plaque and decay! Available in five varieties Cinnamon Mint, Jasmine Mint, Liquorice Mint, Aquatic Mint, and Strong Mint. Launched to mark the Sure partnership with Williams Racing, the highly anticipated new variant is specially formulated to handle the unpredictable, just like the F1. It doesn’t matter how many plans dad's make, sometimes they can’t help but embrace the moment, as the more they move, the more they live. Help make sure dad's prepared and keeping his sweat under control with the new Sure Williams Racing Antiperspirant! Available in 75ml, 125ml and a 50ml roll on. 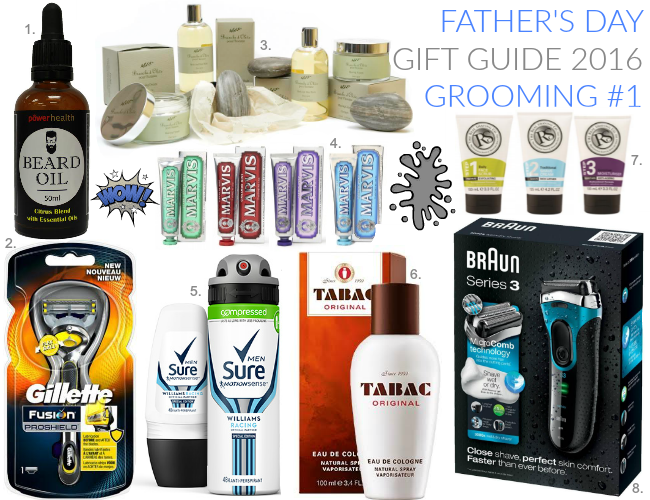 This Father's Day, show your love, thanks and appreciation to Dad with Tabac, a cult classic barbershop scent that retains the heritage of traditional male grooming. Available in a 100ml cologne, a 100ml after shave lotion, a 200ml anti-perspirant deodorant, a 75ml deodorant stick and a 150ml body spray! Is your dad so stuck in his shaving routine that he’s more stubbly than smooth? They say the best gifts are the ones you would never by yourself, so now is the time to treat him with a professional shave and skincare experience this Father’s Day. Dads deserve a bit of pampering. After all they’ve spent the rest of the year running around after you! So why not choose a set of products that he will enjoy using and will leave his skin feeling marvellous? Is your dad always moaning about razor's and how much they cost to replace the heads? Then why not treat him to the Braun Series 3 rechargeable wet and dry electric foil shaver? With MicroComb technology the series 3 catches and feeds more hair into the cutting parts, for a faster shave than ever before. Thanks to its triple action cutting system, sensofoil and precision mode the shaver not only delivers having performance on three day beards, but is also incredibly smooth on skin! Want to treat your dad to a electronic toothbrush and support a great charity at the same time? Then read on for more! In the UK, about 1 in 8 men will get prostate cancer at some point in their lives, it's the second biggest killer of cancers and research is vital. For every WhiteWash charity edition toothbrush sold, £2.50 will be donated to Prostate Cancer UK. The toothbrush itself is a great buy, providing a comprehensive cleaning action that helps to remove plaque and promote healthy teeth and gums! Treat your dad to something new this Father’s Day with the latest additions to the Brisk Beard care range. Due to the demand from bearded men across the country, Brisk is launching three new products to the range! Created with a blend of natural and essential oils, Brisk beard range is designed to coat, soften and tame even the grizzliest of beards. The fast absorbing beard oils and refreshing beard shampoos will help hydrate your dad’s facial fuzz, making skin feel less dry and itchy, and leaving him looking well groomed! This luxurious mini travel kit from Nivea includes everything a modern dad could require on his travels! Take the travelling stress away from dad with this mini kit containing 1 x Shower Gel, 1 x Sensitive Shave Gel, 1 x Sensitive Post Shave Balm, 1 x Anti-Perspirant and 1 x Toothbrush and Toothpaste. Perfect for both wet and dry shaves, this Electric Shaver from Aldi features a triple cutting system with double foils and an integrated long-hair trimmer. Accessories include an adapter, a storage pouch, a cleaning brush and a protective cap. The shaver features a detachable shaving head, a LED indicator, a travel-lock function, a power plug with automatic voltage adaptability, a rechargeable battery and approximately 60 minutes operating time when fully charged. If your dad travels around a lot then this mini Ted Baker set compiled with notes of black pepper, leather and cedarwood; bergamot, eucalyptus and sandalwood, are the perfect hair & body wash and body Spray duos for him! They will keep him smelling fresh from Finland to Fiji or Glastonbury to Reading! The set contains: 2 x 50ml Body Sprays and 2 x 50ml Body Washes. the stash of presents you got him? Let your dad feel the extreme tingle all over his hair and body, packed with 8899 mint leaves, this is not for the faint hearted! Can your dad handle it!? If not, why not go for another one of the Original Source products!? 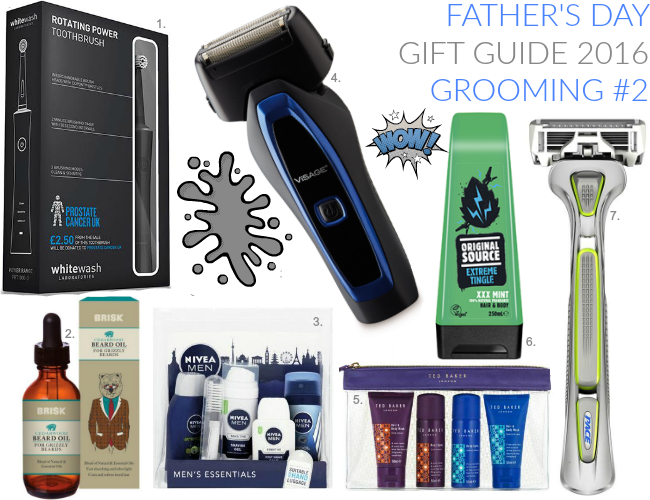 Ditch the never ending stream of sock-related presents this Father’s Day and get your Dad a gift that will keep giving with the DORCO PACE 6 Plus razors! Never again will he wake up to a blunt razor and have a last minute dash to the shops to look sharp! New to the UK market, Dorco has over 60 year's expertise in shaving technology, so they know what's best for dad! Whether he has a beard, sideburns or a bit of stubble, dad can shape and style his facial hair using the razor's trimmer blade, or use the wide guard bar to prepare hair for a deep shave. Also available via a subscription service! Taking puzzlers back to the 60s, this 1,000 piece jigsaw puzzle reminisces the good times whilst the union jack flies high above this iconic British street. Treat your dad to this jigsaw that I'm sure he'll treasure for a lifetime! For the train enthusiast dads out there, this is the perfect gift. Hook up this Father's Day open wagon to any of his existing train sets and watch it embark on its maiden journey. Every side is hugely detailed, with authentic features that stretch from the livery right down to the individual panels and finer details. For any dads who like a challenge, why not gift him the original and the best puzzle in history - the Rubik's Cube! With 43 quintillion combinations and its unique turning and twisting action, this cube conundrum is still the ultimate when it comes to perplexing puzzles! Let the dad in your life recreate thrills and spills of the 007 car chases with this high performance figure-of-eight track. Kitted out with all you’d expect from Scalextric: leap ramps, side swipes, a 90 degree crossover and a bordered 180 degree curve designed to test even the most skilled racer! The Spectre set comes complete with a model Aston Martin DB10 and Jaguar C-X75 as featured in the latest James Bond movie! If your dad enjoys taking time out to play old fashioned games, then this five in one wooden classic game set from Aldi would be the perfect gift this year! Perfect for board game admirers, the set comes complete with the pieces for Mikado, Chess, Draughts and Domino's. Following the record-breaking success of 30-Minute Meals, Britain's most-popular cookbook of all time, Jamie Oliver brings us the even-better 15-Minute Meals. This book is completely devoted to what we are asking for - super quick, tasty, nutritious food that you can eat everyday of the week. It's a classic book that will arm your dad with the skills to create wonderful meals, shockingly fast! This set includes the dual control BAE Hawk T. Mk. 1 which is the RAF’s advanced trainer, used by the Red Arrows since 1979. This starter set includes 59 parts that will create a 1:72 model when complete, making it the perfect gift for any Red Arrows or Airfix mad dads! This book is a wonderful keepsake for children and their dads to fill in together and share special memories. 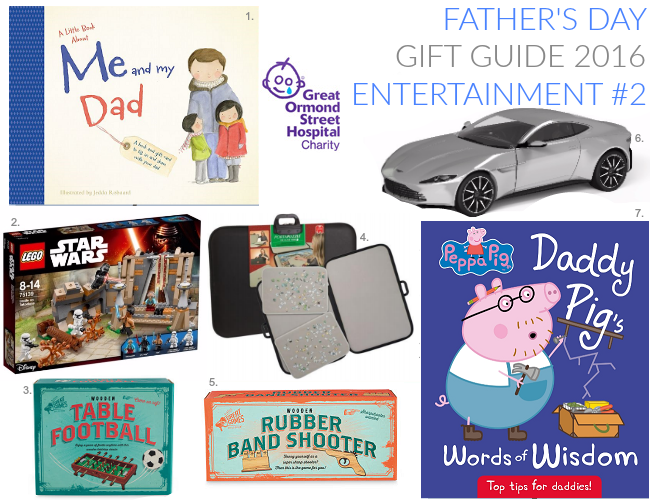 With pouches for photographs and cards, and space for drawings, this charming book will make a wonderful Father's Day gift, what's more, is your supporting a great charity at the same time - Great Ormond Street Hospital - one of the world's famous hospitals located in London. Let your dad own a piece of the action from Star Wars™ The Force Awakens with the new LEGO® Star Wars™ Battle on Takodana™. The heroes of the Resistance are under attack on the planet Takodana! Battle Finn against evil enemy Kylo Ren and the First Order Stormtroopers at the forest castle to ensure their safety. The set features sliding doors, wheel-activated exploding wall and collapsing staircase, falling tree function, plus five minifigures: Finn™, Maz Kanata™, Kylo Ren™ and 2 First Order Stormtroopers™ and is perfect for any LEGO® or Star Wars™ fan! This traditional table football game comes complete with metal balls, score point sticks and wooden footballers making it the perfect small add on gift for any football mad dads! With the EURO's currently being shown on our TV screens, let dad relax watching his favourite country and trying out his own hand skills with this game! Comes complete with a how to guide. Is your dad a jigsaw fan, but often can't complete them? Then this will be the perfect solution to dad's puzzle storage and spatial requirements in a deluxe puzzle case. Dad can build, sort, store and carry his unfinished jigsaw puzzles, without disturbing his work. Includes two additional sorting boards and a leatherette finish. Suitable for puzzles up to 1,000 pieces. Is your dad an arcade fan? The dad who's first to the arcade machine and fair stalls when you go to such places? If so then this traditional shooting gallery game that comes complete with rubber bands, a gun and a wooden target and a how to guide will be a welcoming gift this year! Is your dad a big James Bond fan? Then he Corgi James Bond Aston Martin DB10 will be the perfect gift for him! It's the latest 007 offering to appeal to collectors and fans alike. This 1:36 die-cast miniature is the perfect replica of the Aston Martin DB10 featured in the latest Bond movie SPECTRE, not giving your dad the real thing, but the closest to it! Does the dad in your life need some tips thrown his way? Then Daddy Pig's Words of Wisdom book is the perfect buy for him! Daddy Pig is an expert on many things - looking after Peppa and George, DIY, cooking and much more. 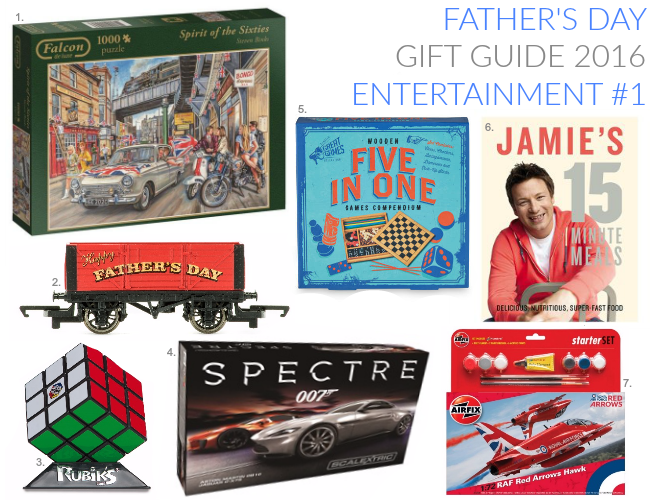 Find out his top tips and celebrate all the things that are wonderful about daddies with this perfect gift for children to share with their fathers! The Kanuka Temple of Heaven Gunpowder Tea will make your Dad’s Father’s Day go with a bang. It's the perfect present for the man who’s always been there to make you a cuppa when times have been tough. Contrary to its name and appearance, this dark and mysterious Chinese ‘pearl’ tea is smooth, clean and uplifting – just like dad. This variety of gunpowder is the most refined available, dried in rolling drums and presented in tightly rolled balls, an indication of its high quality! For Dads with a sweeter tooth, give the gift of chocolate! The Extra Special Belgian Biscuit Selection is a luxurious assortment of sweet wafers with caramelised hazelnuts, almonds and a mix of Belgian dark, milk and white chocolate-coated biscuits. Bacon jam I hear you say!? Is it a jam, a spread or a relish!? Well actually it's all three! Let your dad jam it on some cheese, spread it on some fresh crusty bread or relish it by the spoonful from the jar. The hit condiment from Eat 17 comes in 4 varieties: Original Bacon Jam, Chilli Bacon Jam (with a bit of a kick), and Chorizo Jam (puts a pep in your step), or for a meat-free option, why not try Onion Jam – the secret Eat 17 recipe that started the whole condiment revolution! This Father’s Day, if you're looking for unusual foodie gifts then The Snaffling Pig Co., makers of flavoured pork crackling has it covered. Why not treat your dad to some mouth-wateringly delicious flavoured pork crackling with a range of flavours from the classic Salt & Vinegar to the fiery and feared Pig of Doom!? These tiptop quality meaty treats are double cooked in order to produce a softer product that keeps its bite and are a great way to say thank you to your old man this year! 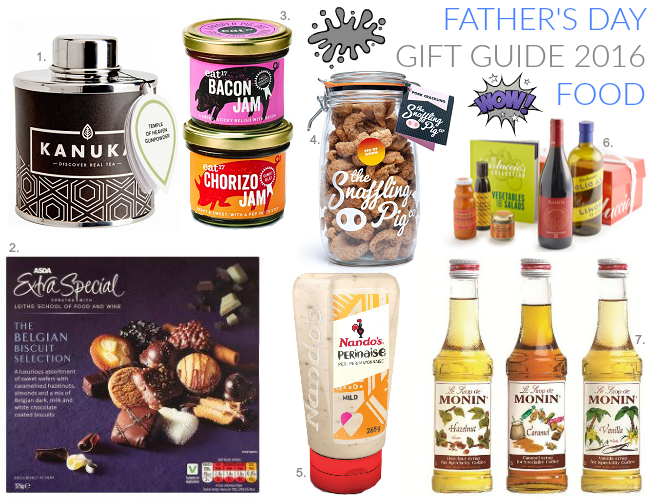 Jog on, boring gifts because with a selection of gifting jars and packs to choose from, there’s no better way to show your dad you care than with The Snaffling Pig Co.
For a Nando's mad dad, gift him with a gift he'll love as Nando's fans can now have their cravings at home as the same, great tasting and famous PERi-PERi blended mayo that you've learnt to love in Nando's restaurants is now available in supermarkets! Packed with heat and heart, the unique bottle has been designed to easily squeeze PERinaise onto anything! Let dad drizzle or lather it onto chips, crisp, sandwiches, salad and more! What does Dad want for Father's Day? A collection of exciting new Italian products that will have him firing up the barbecue faster than you can say "Hey presto"! Carlucco's have sourced exciting new flavours to bring summer dishes to life, without the fuss! Salt & Herb rub, Porcini Balsamic Glaze and Antonio's own recipe Pepolata are all winners for flavour and ease this barbecue season. Add to that their Lemon oil and your dads palette will be amazed! They've matched it with the Cerasuolo di Vittoria - a light red that pairs brilliantly with smoky grilled, or spicy foods. MONIN is the brand used by Costa to make all their flavoured drinks, and a range of MONIN syrups is now available to buy for your Costa mad dad! You can pop a teaspoon in coffee for a burst of flavour, but you can also use them in mocktails, milkshakes, hot chocolates and even baking! The current flavours on offer are Hazelnut, Caramel, Vanilla and – currently on limited edition – Chocolate Cookie. These would make a lovely little budget gift, or an addition to a bigger gift such as a DIY hamper! Asda’s Extra Special Highland Single Malt Scotch Whiskey is a full-bodied whiskey with subtle floral notes, hints of oak and a delectable spicy sweetness. Rich, full and bursting with sherried fruit with creamy oak, a hint of peat and a delicious sweetness, the finish is long and flavoursome with a lingering spiciness. Expertly distilled with pure highland spring water and barley, then matured in American or Spanish oak casks originally used for Bourbon or Sherry to achieve its unique fruity flavour. anCnoc’s 12 year old from the Core Collection is renowned the world over as a must-have in any whisky drinkers’ collection. Soft and aromatic on the nose it has hints of anCnoc’s signature flavour notes of honey and lemon, resulting in a long smooth finish. The 12 year old’s gentle amber colouring comes from its maturation in American oak ex-bourbon and ex-oloroso casks, which deliver a fantastic flavour profile with a surprise at each twist and turn. 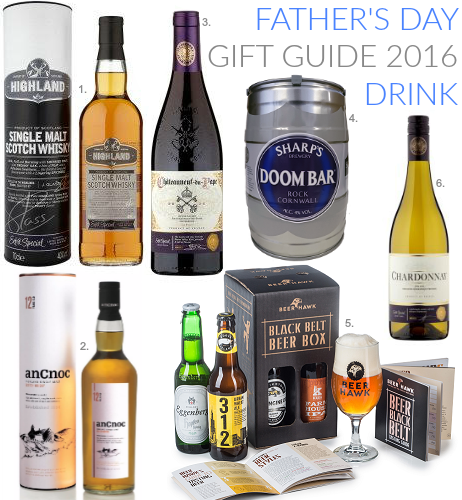 This is the perfect entry level dram, set to convert any dad into a whisky lover. The iconic red wine from the Rhone Valley is rich, powerful & full of flavour! Created from a blend of grapes in the Southern Rhone and named after the Pope's summer palace, it's a characteristically rich and powerful wine from one of the region's top negociants. A fabulous match for venison or casseroles, and perfect for the red wine dad. Cornwall based Sharp’s Brewery known for their exceptional beers, have produced their award winning Amber Ale, Doom Bar. An enticing beer with an aroma of resinous hop, sweet malt and delicate roasted notes. The mouthfeel is a balanced, complex blend of succulent dried fruit, lightly roasted malt and a subtle yet assertive bitterness. The finish is dry and refreshing. The moreish flavours of Doom Bar always wins over the crowds, so it's a popular choice for parties and BBQs and the perfect gift for Father’s Day! When it comes to Father’s Day gifts, there’s no better choice than a specially curated selection of world and craft beers. Like every dad, each beer is unique and distinctive! Beer Hawk, the UK’s leading craft beer shop, has put together these four beers, ideal for dads who want to have black belts in beer knowledge! Filled with information and four beers, what are you waiting for!? This Chardonnay from the Languedoc region is lightly oaked to bring out the delicate and creamy flavour of the grape. A fresh and tasty partner of fish dishes or creamed chicken, or for the dad who likes a glass of white, this is the perfect wine to gift this year! What's more is it doesn't cost the earth with its affordable £5 price tag!